Dark and wondrous, Silent Cheesecake Designs showcases wearable art and curio jewelry, inspired by the natural world. The work of this Los Angeles-based artist features preserved insects, dried flowers, bones, pearls and sea creatures. 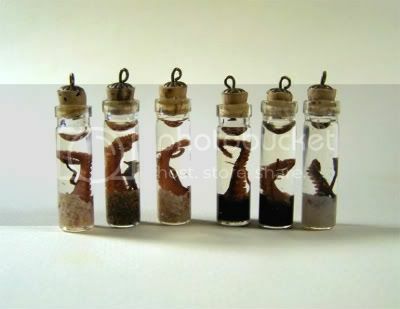 (All specimens are collected safely and humanely, as outlined in the shop owner's profile.) From octopus tentacles in curio vials, venus flytraps in silhouette pendants and cocktail rings made of bone and glass, Silent Cheesecake offers beautiful and unique accessories for those with a curious sensibility. 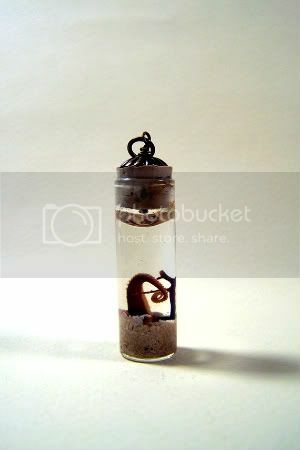 Having recently received one of the insect curio vial necklaces as a gift, I can say from experience that the work is beautiful, meticulous, and all around just cool. You can see the full list of all octopus/sea creature jewelry here. Dear readers, you may have noticed that its been quiet around here. Well a number of our bloggers have recently embarked on new and exciting life adventures, that have left them with much less time for blogging. So the Cephalopod Tea Party is looking for a new intrepid blogger to add to our 'staff' of volunteers. Someone who would like to share their love of cephalopods with the internet. If anyone would like to become a blog contributor, email us, ideally with a few readable complete sentences and some enthusiasm! a class of active predatory mollusks comprising octopuses, squids, and cuttlefish. They have a distinct head with a ring of tentacles around a beak mouth and are able to release a cloud of inky fluid to confuse predators.
. c h o k l i t .
This is a Flickr badge showing public items from the Tentacles - The Pool for Cephalopods of the Subclass Coleoidea group pool. Make your own badge here. Background and banner illustrations © 2008, Sarah Dungan. All rights reserved.